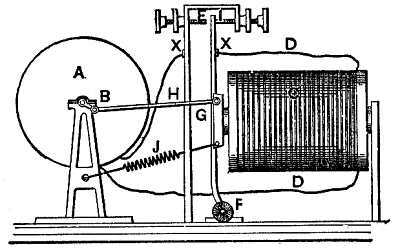 In the engraving, A represents a frictional electrical machine; B, a crank; C, an electro-magnet; D, wire conductors; F, a trunnion; G, an armature; E, a circuit closer; H, a pitman; I, an insulating substance; and J, a spiral spring. The frictional electrical machine is started, which magnetizes the temporary magnet and draws the armature toward it. This breaks the circuit at the point, I, E, which demagnetizes the temporary magnet and allows the spring, J, to again close the circuit. By this means a continued motion is expected to be kept up. To those not familiar with the science of molecular physics this device may appear very plausible; a little reading, however, upon the subject of the correlation of forces will serve to show its utter fallacy. From: Gardner D. Hiscox, M.E., Mechanical Appliances and Novelties of Construction (1927), Norman W. Henley Publ. Co.